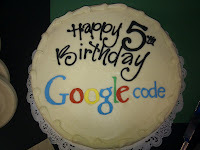 Happy 5th Birthday Google Code! How time flies! It was about five years ago that we launched Google Code to the world. When we launched Google Code, we wanted to make code.google.com a great resource where developers could learn about our vision for open source and the open web. We started in 2005 with a handful of our own open source projects, links to just eight APIs and an announcement of the first ever Google Summer of Code, our now-annual program that introduces university students to open source development. By 2006 our API list had grown to 21, in 2007 there were 37, and today our collection of more than 60 APIs receive over four billion hits per day. 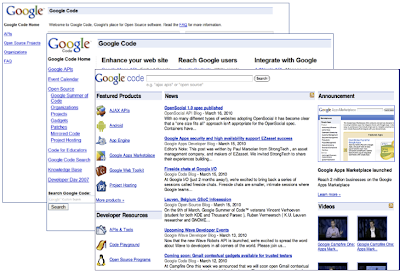 Check out the changing face of Google Code below -- from 2005, 2007 to the present. With the meaning of open in mind, Google Code set out to foster best practices in developer documentation, build a community around web and open source development and demonstrate the power of Google technologies. Over the past five years code.google.com has come a long way from eight APIs, maturing into a destination for developers to explore our growing family of APIs and developer products, whether they speed up the web, alleviate cross-browser issues, make hosting web applications easy and scalable or make the web a more social place. Google Code has also become an interactive place to share ideas. Not only can developers prototype their work in a Code Playground, they can also use Project Hosting on Google Code, a fast, reliable and easy way for developers to host all kinds of open source projects. Today, there are more than 240,000 projects registered, with commits coming in at about 17,000 per day...about 1 every 5 seconds. We also host 800 open source projects of our own, including four projects (Android, Chrome, Chrome OS and GWT) with over a million lines of code each. It’s been an amazing five years, but there’s still a lot of work ahead. We’re dedicated to helping the developer and open source communities thrive in as many ways as we can. To celebrate our birthday and thank everyone for supporting code.google.com over the years we’re rolling out a new, faster Subversion server, which will double the source code storage for Project Hosting on Google Code from 1GB to 2GB. Happy coding! Google Code has been tremendously beneficial to me. Will somebody from Google put down the party hats and fix the gdata error! love google code.. way better experience than any thing ive' tried before. 5 years ago subversion may have a been a progress compared to cvs, good luck in modernizing the platform. This birthday is like that episode of Seinfeld where the birthday candles start a fire and George goes running ahead of all the kids to get out. Except that, in this case Picasa's API is the birthday candle burning down. However, I'd like to see a fix from Google so I can go enjoy St. Pats day. You should be shamed choosing Hg over Git.